When traveling to Laos, we do not miss the opportunity to explore Luang Prabang Night Market. Luang Prabang Night Market has two main areas: Market food and souvenir market, open from about 6 pm, until 10 am every night. The favorite itinerary of tourists is climbing up the mountain Phousi sunset, then crossing over market for Laos traditional culinary taste, and buying souvenirs. Food market in an alley on Sisavangvong, inside an ancient temple. Just head to the market, smell fragrant grilled flying out of the shop full of food products will attract your steps. There are a total of four rows, running along the entire length of the street. Many vendors come from nearby Hmong Market, as it disperses right before sunset, and they bring along with them the same collection of ethnic handicrafts and trinkets that they were selling there. 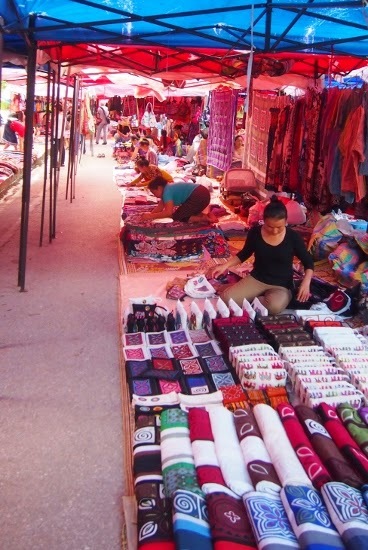 Embroidered bags and purses of various sizes and colours, screened ‘Beer Lao’ T-shirts, cotton pants and shirts, bed covers, woven scarves, opium pipes and accessories, paper lanterns – these are popular items you will see repeatedly as you stroll through the market. Keep your eyes open, though, for a handful of stalls popping up from time to time that offer something slightly different. Apart from the market vendors, shop-houses and hotels lining both sides of the road are also open for business. The range of products include handmade souvenirs, Lao coffee beans, homemade whiskeys, books, all the way to street-side noodle stalls tucked away in a small lane and hotel sidewalk cafés serving drinks and, of course, Beer Lao. 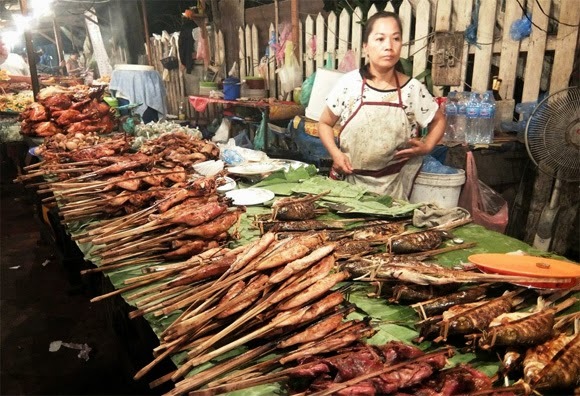 For a serious meal, though, head over to the end of the market (where Sisavangvong Road meets Settathilat Road) and you will find the Night Food Market as well as food vendors down the narrow lane just next to it. Note that the market can get very crowded after 20:00. Nice post, thanks for sharing, Also, Apart from the market vendors, shop-houses and hotels lining both sides of the road are also open for business. The range of products include handmade souvenirs, Lao coffee beans, homemade whiskeys, books, all the way to street-side noodle stalls tucked away in a small lane and hotel sidewalk cafés serving drinks and, of course, Beer Lao.